Here’s a fascinating idea – Facebook looks to be partnering with Eventbrite to let users sell tickets to the 3.5 million events added to Facebook each month. Earlier this month we confirmed that Facebook intends to sell tickets to its upcoming F8 developer conference through Eventbrite. But there was no indication that the partnership extended beyond that. 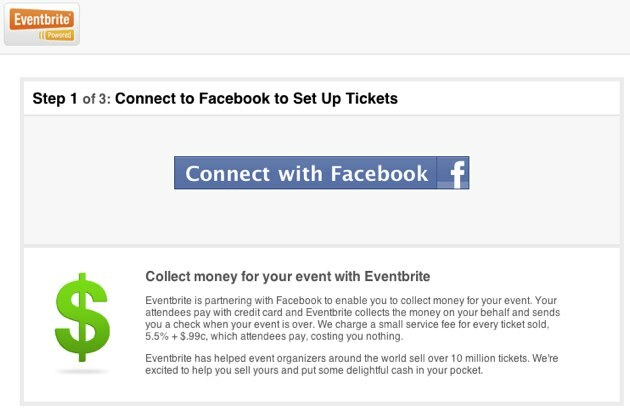 Eventbrite is partnering with Facebook to enable you to collect money for your event. Your attendees pay with credit card and Eventbrite collects the money on your behalf and sends you a check when your event is over. We charge a small service fee for every ticket sold. 5.5% + $.99c, which attendees pay, costing you nothing. Eventbrite has helped event organizers around the world sell over 10 million tickets. We’re excited to help you sell your and put some delightful cash in your pocket. Like the F8 event, this is set up on Eventbrite’s site, and it seems likely that Facebook will send users there that want to monetize events, have them log in via Facebook Connect, and finish the process. We interviewed Eventbrite founders Kevin Hartz and Julia Hartz last last year when they announced funding from Sequioia Capital. The company is growing fast and expects over $100 million in gross ticket sales this year. A Facebook partnership would add a lot of flow to the service, obviously. And even though only a small percentage of events need ticket sales, lots of them want to give out free tickets. Eventbrite does that without any fee and calls it viral marketing. When we asked Eventbrite’s Kevin Hartz about the screenshot he said Sorry, “Mike, can’t comment at this time/We never comment on deal speculation.” Facebook hasn’t yet responded to our request for comment.